﻿ FENFAST Ingredients - What are the ingredients in FENFAST 375? The FENFAST 375 ingredients have each been carefully tested and researched to provide a product that is powerfully beneficial but also safe enough for long term use. Intechra Health's team of scientists who engineered this formulation meticulously chose EVERY ingredient for their general safety and clinically researched benefits that can support healthy weight management. 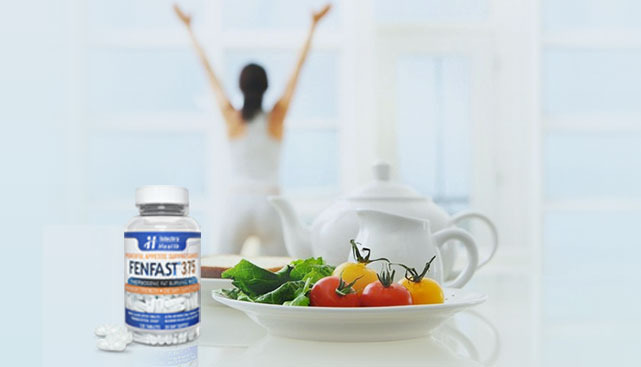 FENFAST ingredients were then combined in the ideal quantities to promote a healthier weight through enhanced energy levels and improved mental acuity, so you can stay focused on reaching your goals. The first on the list of the ingredients that comprise the FENFAST formulation is L-Phenylalanine. This substance is sometimes seen in the highest quality diet pills because of the many benefits that it has been shown to offer dieters. When taken in the appropriate amount, this ingredient can be very helpful. L-Phenylalanine is an amino acid that is used for a number of purposes by the human body. Scientists have been very curious about the various advantages that this substance has to offer and the different applications that it can have, such as in the area of weight loss. For this reason, it has been clinically studied for several years to make sure that its impact on the body is well understood. It has been shown to offer numerous beneficial effects. A great deal of the research* that has been performed on L-Phenylalanine, particularly in recent years, has been directed toward the impact that it can have on weight management. It is used by the body to make chemical messengers responsible for energy regulation and intake. This is especially important for dieters, as certain chemical messengers, such as dopamine, have been shown to enhance concentration and motivation. Chemical messengers in the brain play a major role in everything from satiety, alerntness, energy and thermogenesis. A thermogenic effect boosts lipolysis, converting body fat into energy. By helping to boost the body’s energy levels, you can burn through more calories every day through exercise. Next among the FENFAST ingredients is caffeine. This is a well known and highly studied synthesized stimulant which is commonly known for its ability to build the metabolic rate. When the metabolism achieves a higher performance, it means that the body is better able to burn through calories and fats, which can make weight loss easier for a dieter – particularly when combined with proper eating and exercise. Research has indicated that by using caffeine regularly, and in the right doses, obese patients were able to decrease their levels of body fat*. The way that this first among the FENFAST ingredients works is through a thermogenic process. This occurs when the body temperature is increased, causing energy (in the form of calories and fat) to be expended as heat. Studies have indicated that the heavier a person is, the greater the effect of thermogenesis on the body. Among the FENFAST ingredients, caffeine may also function as an appetite suppressant. This is very handy for assisting in eating a smaller amount of food, which can help to promote weight management. The formula functions very well in conjunction with a reduced calorie diet plan. The next ingredient in the powerful FENFAST formulation is Hordenine HCl. This proprietary formula is enhanced in a very important way through the inclusion of this substance. An alkaloid of phenylethylamine (PEA), which is another ingredient that is well known within the diet support industry, this plant derived substance has undergone extensive scientific study*** to help to build a thorough understanding of how it can increase energy levels and provide mood enhancement. These are both very important benefits in that they may help to stave off fatigue – a common struggle among dieters – and maintain motivation to continue with the diet until weight management goals have been successfully achieved. Finally, the FENFAST 375 formula would not be complete or nearly as effective without the addition of L-Theanine. Clinically researched and used worldwide, L-Theanine has been shown to be helpful for reducing stress and anxiety****. An effective ingredient that helps people to feel more relaxed while dieting is important. L-Theanine can help people overcome anxiety and stress due to dieting and making changes to their eating habits. It may be particularly helpful for people who are struggling with food addiction.